Performance Time: Approximately 45-60 mins, 58 pgs. COMEDY COLLECTION. Everyone needs a break in this comically chaotic collection of four short plays. In “Addicts Anonymous,” five people attend an Addicts Anonymous meeting but it’s not for drug or alcohol abuse?it’s for technology junkies! In “As You Wish,” a couple takes turns wishing on shooting stars only to discover that their outrageous wishes actually come true. In “The Great Pompachelli,” a “love expert” helps a lonely guy woo the girl of his dreams with famous movie lines. 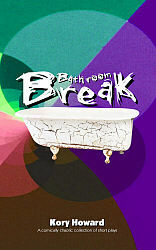 And in “Bathroom Break,” a mother yearning for some time to herself has to lock herself in the bathroom to get a break from her needy husband and teenaged kids.